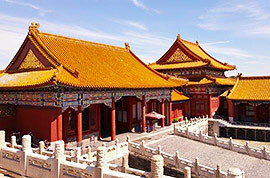 How long should I stay for a basic private Beijing tour package? 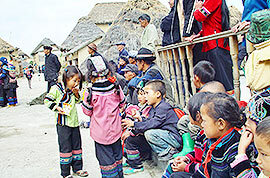 In addition to the arrival day and departure day, two or three full days are necessary for first-time travelers to arrange a vacation package to the city. Here is the most popular way of exploring the city. 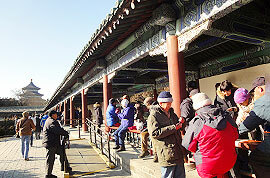 Have one full day to visit the Great Wall and Sacred Way. 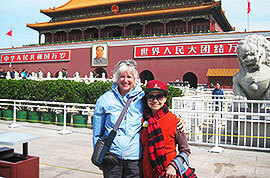 Another full day is needed to visit the Forbidden City, Tiananmen Square and the Temple of Heaven. 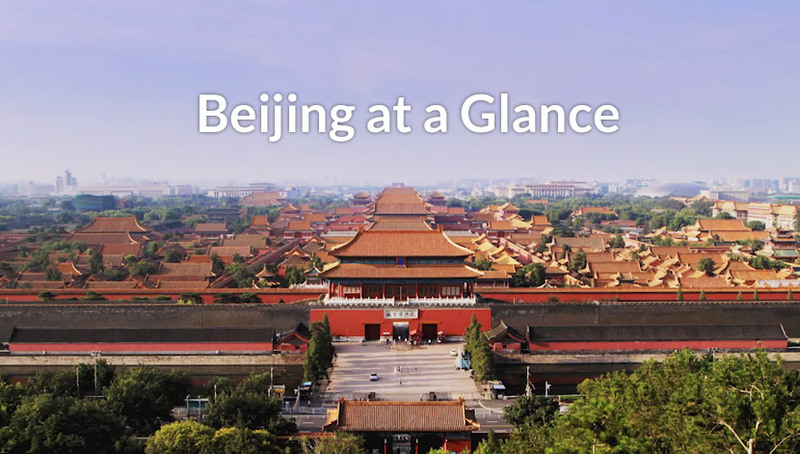 If you have ample time, you can schedule one more day to visit the Summer Palace, old Hutong alleys, Lama Temple and the lovely giant pandas in the zoo. I have heard the Great Wall has several sections, which one do you recommend? 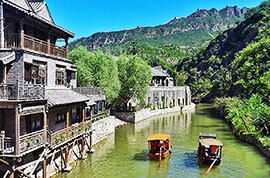 The Badaling section is the most famous and should be first choice for China Great Wall vacation. It was the first section opened to the public and the wall here is more grand and amazing, especially for taking photos. 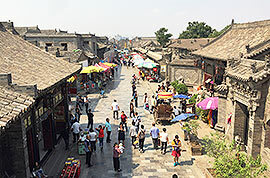 However, if your trip is during peak seasons or Chinese holidays, you may consider visiting the less-crowded but equally majestic Mutianyu section. Are sightseeing spots in the city physically demanding? Will there be too much walking involved? Yes. 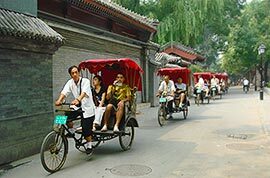 Most of sightseeing spots such as the Forbidden City and the Summer Palace are very large, and demand a fair amount of walking. 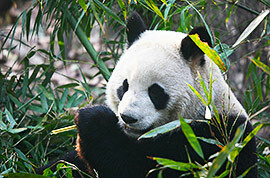 However, you can ask your private guide to slow down the travel pace. 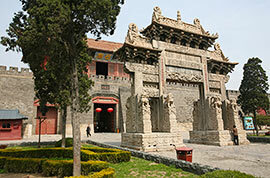 Although there are many stairs on the Great Wall, you can take the cable car should you prefer. A pair of comfortable shoes is always highly recommended when traveling. 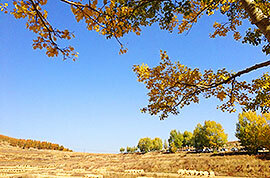 The amazing scenery of the Great Wall changes throughout the seasons. From March to early April, the wall is dotted with apricot flowers and peach blossom along the mountain range. You can view the luxurious green plants surrounding the wall when climbing it between May and September. Then from mid October to early November, it is beautifully decorated by red leaves. Although the weather is cold and challenging from late November to February, visitors get to see the snow-covered Great Wall set in a tranquil landscape. In comparison, it is more enjoyable to visit the Great Wall in April, May, September and October when the weather is neither too hot nor too cold. 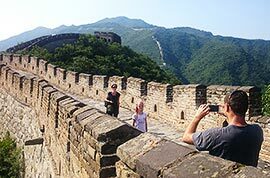 Is it possible to visit two parts of the Great Wall within one day? 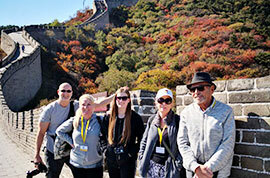 Yes, we can arrange for clients to visit two different sections of the Great Wall within one day. Both Badaling and Mutianyu are very popular, so these two are the most exhilarating combination for a full day private Great Wall excursion. 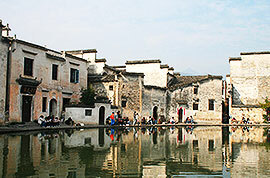 Alternatively, visitors may choose to visit Juyuongguan Great Wall together with Badaling instead of Mutianyu. 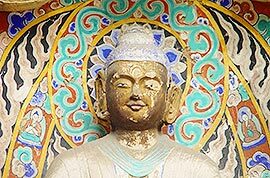 How and where do I apply for a 144 hours visa-free transit permit in Beijing? First of all, you need to make sure that you are qualified to take advantage of the 144 hours visa-free transit policy. 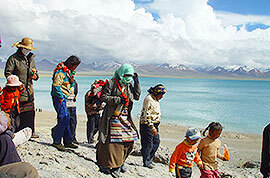 You can click China 144-hour visa free trainsit to read the relevant details. With all the necessary documents, you can apply for the 144-hour visa-free transit permit on arriving at the Capital International Airport or Beijing West Railway Station. There is a special counter/lane for the 144-hour free transit at the immigration, so passengers can go there directly by following the signs. Do we need to wait in line to buy the admission tickets at tourist attractions? No. Your guide will handle all the admission tickets for you. She/ He will buy tickets in the group ticket window very quickly. Some of the very popular sightseeing spots have online ticketing system, and we will reserve the tickets for you in advance. 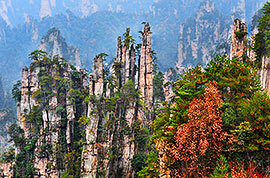 If I want to visit somewhere else for one or two days during China Tours from Beijing, what's your recommendation? 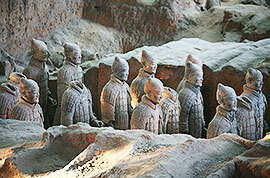 Many travelers have the Terracotta Warriors on their holiday bucket lists, so one or two days trip to Xian is recommended. 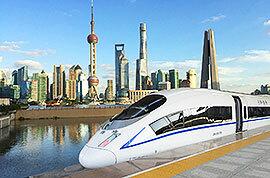 It is very easy to make it as flights and high-speed trains between the two cities operate frequently every day. 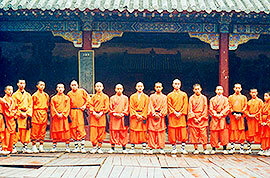 Besides, you may also consider visiting Luoyang Longmen Grottoes and Shaolin Temple by high-speed train. We are a family of two adults and two children under 10 years old. Can we be accommodated in one hotel room? Yes. Two adults and two little children can be accommodated in one room, but it is not recommended for a comfortable stay. Most of hotels have a king size bed with 1.8 meters wide in a double room and two single beds each with 1.2 meters wide in a twin room. One of your children could take an additional 0.9 meter wide bed. The other one needs to share a bed with parent. The bed size may vary a little in different hotels. I've been meaning to write since I arrived back home, but have been so busy getting back into life again. Allyson and I so enjoyed our journey that we were not ready to come home yet. 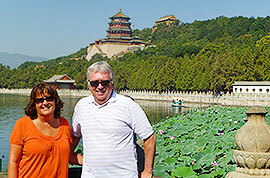 We loved Beijing and wished we had more time there. Our guide Brian, was wonderful and so helpful in every way. I highly recommend him as a guide. I am sorry they could not help us with the extra expense for the upgraded cabin, but I understand. I do think, however, they should offer that ahead of time so it can be arranged before boarding the ship. I have met with some clients since I have been home that I recommend the company to. They were going to take a tour with another company, but after I told them how happy that we were with Travel China Guide, they changed their mind. Excellent Tour and well organized. Tony was a great guide. 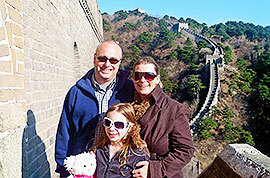 It would have been nice to hear more stories about great wall history. 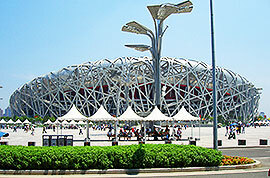 Our 5 days Beijing trip was so hassle free booking with this company, everything went exactly as they had promised. I certainly do not hesitate to recommend TCG’s services and have already done so to my friends who are interested in travelling to China. 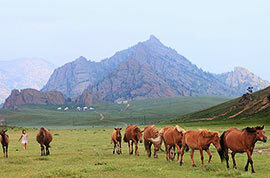 We are thinking of another trip next year, perhaps to Xinjiang and Xian so, look forward to having their arrange that for us as well, once we have made a decision. Everything was very good planned, very good food and hotel. The visits to the sights were good to do with the guides. We enjoy our duration in each city and hope we have chance to go back again. The guides all did their job, were on time and were very courteous. We were somewhat put-off by the personal questions they would ask, but we think this was their way of trying to be friendly. 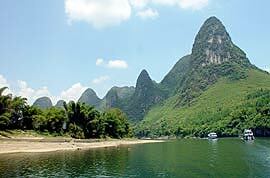 We felt the most professional guides were Carol in Xian, and Ocean in Shanghai. Overall, the China trip was wonderful and we want to thank our agent Linda very much for her time and patience through the planning phase. Steve and I want to thank Emily for providing us with such a wonderful holiday. It was one of the best travel experiences that we've had. In regards to the restaurants, we were under the impression that they had been chosen by Emily rather than the local guide. However this did not seem to be the case in every location. The best dining experience was at a local restaurant in Xian. Our guide, Tracy, suggested this and we especially liked the small intimate feeling of the place as compared to the open, larger restaurants which seemed suited more for tour groups. Kitty in Beijing was most innovative by showing us pictures of the traditional dishes and allowed us to choose the ones we had an interest in before arriving at the restaurant. All our meals were good. All our hotel selections were perfect for us. The hotel in Xian was the only one we had a problem with and that is one we chose ourselves... The hotel in Beijing was the perfect location with an excellent room, good service and the best restaurant of all the hotels we stayed in. Beijing to Tokyo and Tokyo back to Dallas. Do we qualify for the 144 visa waiver? Yes, you qualify for the 144 visa free policy. Does Hong Kong consider third country or part of China? You could get 144 hours free transit in Beijing twice. Nice trip. Hi there, do I need visa with Iranian passport traveling to Iran from Vancouver? 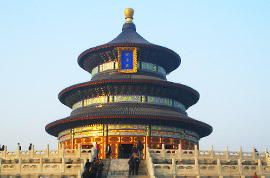 If your layover time in Beijing is under 24 hours, you can get 24h twov. No need to apply for visa. I would like to use the transit visa free option but I am arriving into Pudong airport (PVG) from Macau and departing from PEK airport to London. Is this ok? Also do I apply online fir the visa or on arrival? As I know, you are not eligible for the transit visa exemption if you will stop at both Pudong Airport and PEK airport. 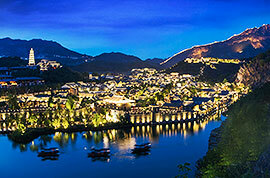 You may apply for China visa in advance if you would like to leave two airports. Traveling for Newark NJ to Beijing 6 hr layover then to Chiang Mai then Bangkok then Phuket and back to Beijing for a 3 day stay before we fly back to Newark NJ. Are we able to use the 72 or 144 hr transit visa? Yes, you are able to use the 72 or 144 hr transit free.